Very little solid evidence exists that microloans make a dent in long-term poverty. Sadly, evidence does exist for negligence, corruption, and methods that border on extortion. Part exposé, part memoir, and part financial detective story, this is the account of a one-time true believer whose decade in the industry turned him into a heretic. Hugh Sinclair worked with several microfinance institutions around the world. He couldn’t help but notice that even with a booming $70 billion industry on their side, the poor didn’t seem any better off. Exorbitant interest rates led borrowers into never-ending debt spirals, and aggressive collection practices resulted in cases of forced prostitution, child labor, suicide, and nationwide revolts against the microfinance community. Sinclair weaves a shocking tale of a system increasingly focused on maximizing profits—particularly once large banks got involved. 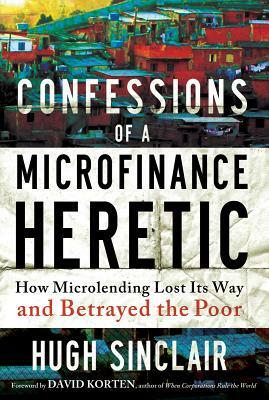 He details his discovery of several scandals, one of the most disturbing involving a large African microfinance institution of questionable legality that charged interest rates in excess of 100 percent per year and whose investors and supporters included some of the most celebrated leaders of the microfinance sector. Sinclair’s objections were first met with silence, then threats, attempted bribery, and a court case, and eventually led him to become a principal whistleblower in a sector that had lost its soul. Microfinance can work—Sinclair describes moving experiences with several ethical and effective organizations and explains what made them different. But without the fundamental reforms that Sinclair recommends here, microfinance will remain an “investment opportunity” that will leave the poor with hollow promises and empty pockets. Hugh Sinclair has worked in microfinance with numerous global organizations, banks, and funds for over a decade. He currently consults on microfinance strategy and portfolio management. Previously, he worked in traditional finance at ING Barings, CDC Capital Partners, and BZW Securities—now Barclays Capital. Sinclair holds a master’s degree in international and corporate finance from the University of Durham and a master of business administration from IESE Business School. Among his accomplishments are being the first to deliver a Harvard Business School case study in Mongolian and achieving the Guinness World Record for the fastest motorcycle tour from Prudhoe Bay, Alaska, to the tip of South America. He speaks frequently at business schools and microfinance conferences. —Milford Bateman, freelance consultant, Visiting Professor of Economics, University of Juraj Dobrila at Pula, Croatia, and author of Why Doesn’t Microfinance Work?